La Table will offer their pumpkin pie with meringue to-go via pre-order through Wednesday, November 22. Photo courtesy of La Table. Maybe you missed the deadline to pre-order Thanksgiving pies or maybe you’re concerned that the guest who pledged to bring dessert isn’t going to come through. Either way, you’re not out of luck; there are still plenty of places to pick up quality pies and desserts before the guests arrive. So, free up the oven and head to one of the following spots for peace of mind and mind-blowing desserts, but don’t wait too long—traditional favorites go fast and most places won’t be open Thanksgiving Day. Central Market, 3815 Westheimer: To avoid the busiest hours and cranky customers, visit Central Market’s bakery during non-peak hours in the days leading up the Thanksgiving. For anyone truly in a bind, the store will be open on Thanksgiving Day from 7 a.m. to 2 p.m. A variety of holiday pies are available. Prices range from $10.99 for pumpkin chiffon to $19.99 for deep-dish pecan. Dacapo’s Pastry Cafe, 1141 East 11th: If you’re in search of the ultimate pecan pie for Turkey Day, this Heights-based bakery offers three varieties to choose from: their signature original, Cinnamon Pecan and Brownie Pecan. Fans of fruit pies may also opt for Dutch Apple or Berry Blast, which includes a mix of blackberries, blueberries, raspberries and cranberries baked in a lemon zest sugared crust. If you’re hoping to avoid the crowds, the cafe does accept online orders via GrubHub, but you may want to go in person to scope out what’s available in the days leading up to Thanksgiving. Note that on Wednesday, November 22, the cafe will close an hour early, at 5 p.m. and remain closed on Thanksgiving Day. Flying Saucer Pie Company, 436 West Crosstimbers: For Thanksgiving week, traditional fruit and cream pies of all kinds are available at Flying Saucer from 7 a.m. to 7 p.m. on Monday and Tuesday, and from 7 a.m. to 5 p.m. on Wednesday. Prices range from $13.75 to $15.25, depending on the variety. No pre-orders are available during this busy week, which means pies are first come, first serve, with no holds or reservations. Flying Saucer Pie Company is almost as famous for its long lines before Thanksgiving as for its desserts. Be prepared to patiently wait in line. Try and minimize the wait—and maximize the selection—by going early. 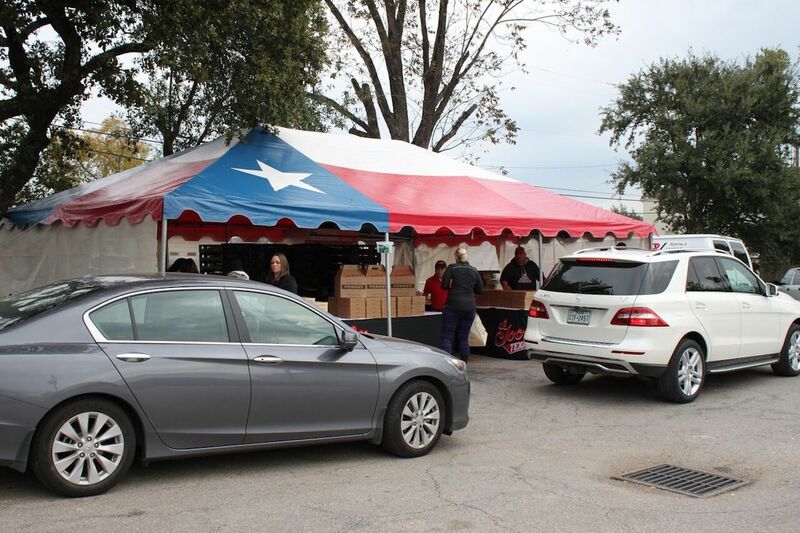 Every year at Thanksgiving, the Goode Co. Pie Booth stays busy selling its famous Brazos Bottom Pecan Pies. Photo by Amanda Calderon. Goode Company: Each restaurant location will host the annual drive-through pie booth the two days before Thanksgiving, November 21-22, from 8 a.m. to 5 p.m. You won’t need a pre-order to pick up the restaurant’s signature Brazos Bottom Pecan Pie, known for its gooey, rich flavor and fresh Texas pecans, but availability will be limited, so arrive early to avoid lines and disappointment if the pies run out. House of Pies, multiple locations: You’ll have to head to a House of Pie location and make the order at the restaurant if you plan to pick up pies, as pre-orders over the phone are not available during the weeks of Thanksgiving or Christmas. Though it’s first come, first served, with plenty of fruit, nut, chocolate and meringue options, it’s unlikely you’ll head home empty-handed. House of Pies locations are open 24 hours, including holidays, but be prepared for a wait if you arrive during peak hours. More information is available on the web site. Pie prices range from $13 to $15, with cakes running $21 to $23. 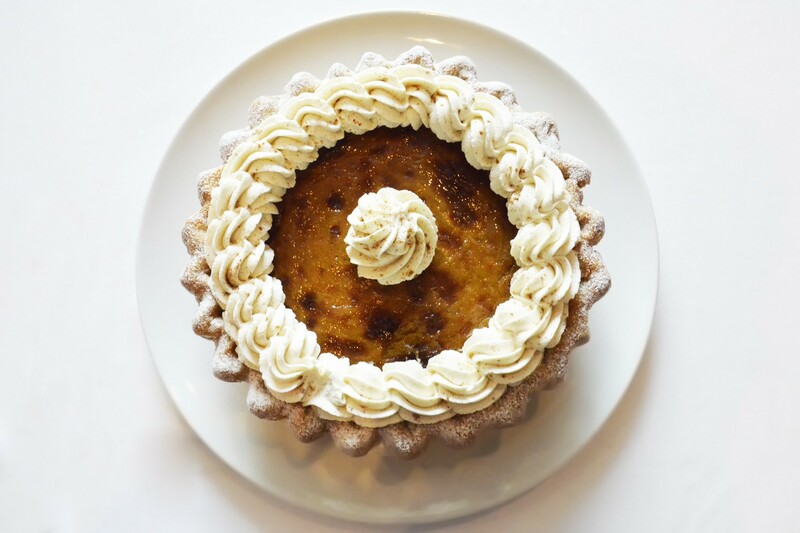 La Table, 1800 Post Oak: There’s still time to pre-order pumpkin and bourbon pecan pies before the holiday from Macarons Bakery on the first floor of La Table. At $25 each, the pies serve six to eight people and make a stunning end to a home-cooked meal. La Table will accept pie orders until Wednesday, November 22. Call (713) 439-1000 to place an order or for more information. 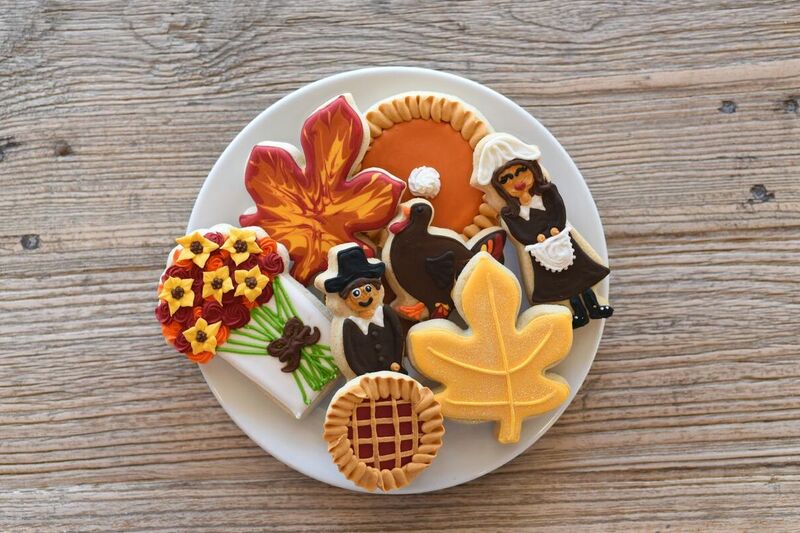 In addition to traditional pies, Ooh La La offers Thanksgiving cookies—including one in the shape of a pumpkin pie. Photo by Kimberly Park. Ooh La La, multiple locations: While all locations close on Thursday, Ooh La La bakeries are open regular hours through Wednesday. Even if you can’t get your hands on a traditional pecan or pumpkin pie, guests will appreciate Thanksgiving-themed cookies and Reese’s Pie made with chocolate and peanut butter. Hosting guests on Friday? The Cinco Ranch and Town & Country locations are offering 25-percent off all baked goods all day on Friday—a pretty sweet deal. The Pie Factory, 5611 Bellaire Boulevard, Suite 128: As the name suggests, this bakery in Bellaire offers 10-inch pies in more than 30 varieties, including traditional pecan, pumpkin, and sweet potato. On Wednesday, November 22, the Pie Factory is open an hour later than usual—from 8 a.m. to 6 p.m.— to accommodate last-minute Thanksgiving shoppers. Call (713) 666-8501 for more information and to ask about availability. Three Brothers, multiple locations: While all locations are closed on Thursday, each bakery is open regular hours through Wednesday. The easiest and most convenient way to order a Three Brothers pie—or Thanksgiving cake, if you’re really going all out—is to pre-order through the online system. Note that all online orders require two preparation days before pickup, delivery, or shipment, but a rush order can be requested by calling any Three Brothers location. Whole Foods, multiple locations: Braving the grocery store crowds (even the upscale ones) to fight through lines and grab one of the last apple pies is a last-ditch maneuver for the desperate. However, by ordering online from a specific store, the pie-hungry can see what’s available, pay and set the pickup time all from the comfort of their homes or workplaces. Online orders typically requires a 48-hour window for pick up. So hurry: time’s a wastin’. $18 pies at Cleburne Cafeteria are another option. Some of the pie crusts and overly sweet fillings from places on this list wouldn’t merit recommendation from me.